Connecticut Looks To Sell Its Obamacare Exchange To Other States : Shots - Health News Problems with online insurance marketplaces have hampered the implementation of the Affordable Care Act in many states. Connecticut, a success story, is trying to turn its expertise into a business. 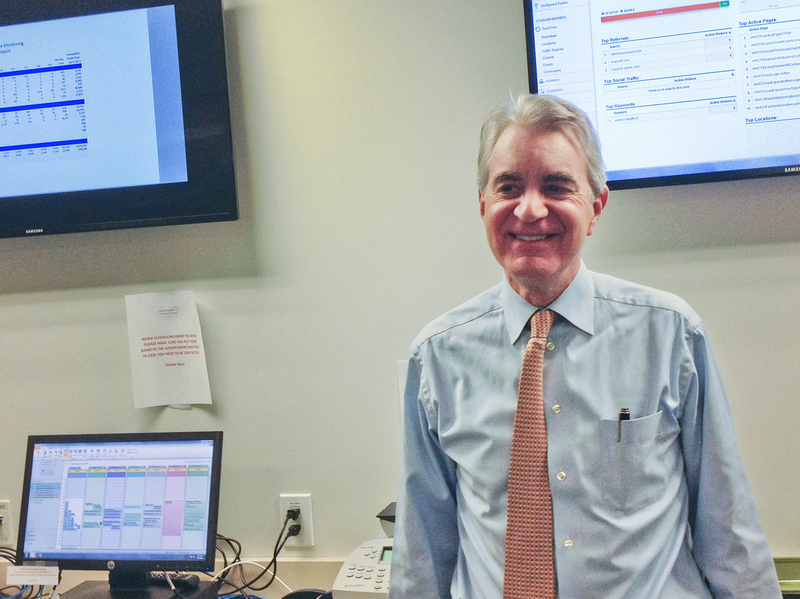 Kevin Counihan, CEO of Connecticut's health insurance exchange, hopes to be able to market their expertise. "These are showing in real time, activity on our website. So, for example, right now you're looking at the number of concurrent users on the site," Counihan says. "So you can see that there are 212 people in the process of applying for insurance on the site." The monitors and technology are just a part of what his agency is doing right. Connecticut is widely seen as one of the states that is succeeding with the Affordable Care Act. The state's website works well, and it has already exceeded its first-year enrollment goals. Other states have noticed. "We were approached by several states who called us and said, 'Would you have any interest in franchising your exchange to us as a state?' And so, as we thought about that, we began coming up with this concept of an 'exchange in a box,' " says Counihan. Think of it as Obamacare a la carte. Need an effective executive team? Let Counihan's people run your show, for a fee. Need help managing your vendors? They can do that, too. The Connecticut exchange's technology infrastructure can be scaled to fit any need, he says. Connecticut can deliver a state-specific look and feel, too. Sales. Marketing. Legal. Why do it yourself, when Connecticut can do it for you? "My only point to some of these other states is, why go through all that agita? Why recreate a wheel somebody else already built?" Counihan says, sounding every bit the salesman. And he is, because the effort could help Counihan bring new revenue into the exchange. NPR approached several states that have struggled to implement Obamacare for comment. None confirmed contact with Connecticut. But Oregon said it's looking at technology alternatives should its vendor not deliver by the end of March. Maryland officials said earlier this month that they are actively investigating their options. Just this week, the state fired its healthcare IT contractor and picked a new one. Not everything is perfect in Connecticut. The state's Spanish language enrollment website just went live — with barely a month to go before open enrollment ends. Still, people who work for Counihan say Connecticut has a lot to offer. "The second name of this city is the insurance capital of the world," says Jim Wadleigh, the chief information officer for Access Health CT. "As you look at our entire leadership team, we come from the Cignas, the Aetnas, the Uniteds, the Health Nets, all those companies. That is probably what's helped us be so successful. We understand health care." They also understand timing. Counihan says states that need help getting ready for the next open enrollment in November have a few weeks to decide how to proceed. But the clock, he says, is ticking. This story is part of a collaboration among NPR, WNPR and Kaiser Health News.